One of the joys of RV travel is how easy it makes attending your favorite events. With a little planning, you can experience some of the nation’s great spectator sports up close — all while saving money on lodging and enjoying a laid-back good time with friends and family! NASCAR races are prime choice RV camping events because of how close you can get to the action. Plus, the fun doesn’t end when the cars leave the track. You’ll be situated right next to the pits and race team paddocks — where you can explore competitors’ cars and possibly meet professional teams and drivers. Don’t have an RV, but still want to try out NASCAR RV camping and tailgating? You can rent RVs in many different configurations for a reasonable price. Don’t knock it, RV owners. You know you don’t love paying for it when things break. Find NASCAR RV rentals and packages that include NASCAR infield RV parking. There’s one thing I can’t stress enough: Don’t hesitate finding a good spot. If it’s a large race like Daytona or The Brickyard, be prepared for a good spot on the infield to run in excess of $1,000. You might feel like you’re getting fleeced at first, but remember you’ll be closest to the action. If you don’t act quickly, spots will fill up and you won’t be able to attend. It took me 2 failed attempts finding tickets for Charlotte’s Coca-Cola 600 before I finally set a reminder to alert me when tickets went on sale the next year. Trust me, if you don’t act fast, you’ll be sorry. Certain campsites have a more family-friendly atmosphere, and certain campsites are reserved for those who want to party. So, do your research on forums and fan sites, and find out what location best fits your needs. Also pay attention to reports about air quality and closeness of camping. One time I picked a spot that was low in the infield at Texas Motor Speedway. I was stuck breathing tire smoke all weekend. It didn’t add to the experience. 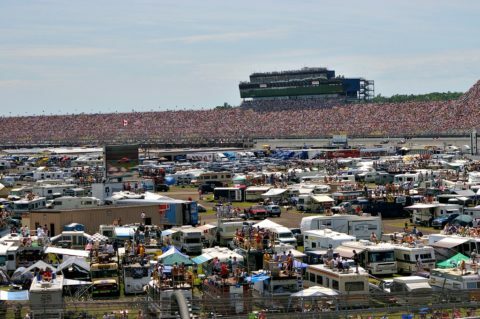 Here are NASCAR’s 10 best spots for camping & tailgating. Make sure you have enough camp food, fuel, clothing, and pastime activities (like board games and movies) to get through the weekend. It’s a good idea to make a list and keep it with you. There are a few things you can’t bring to NASCAR events. Typically, these fall into the category of items that someone could use to smuggle in weapons or illicit materials. Coolers and bags over 14 inches in length are often at the top of the list — but check the racetrack website for specific details about the venue’s rules. See the ultimate RV camping checklist. Preparing the RV itself is equally as important as making sure your camping supplies are in order. If it’s a particularly long drive to the NASCAR track, then you should check on things like transmission fluid and coolant ahead of time. I always check engine oil, tire pressure, lights, batteries, and 120v power before any RV trip. You should expect to be dry camping and bring a generator — unless you’re with a race team, in which case you might get a hookup. Here’s a good list of things to do before you leave home. Another thing you should bring is your barbeque grill and some sunscreen. Provided you’re with the right crowd, tailgating at NASCAR races can be a quality time. An ice chest and slow cooker are 2 great additions to your inventory that will serve you well on race day. Be prepared to share your provisions, too. I’ve made great friends simply by trading a beer with the neighbors on the infield. Track-sponsored shops and facilities may be available to RV campers — so be sure to check out the track’s fan page for the details. Some tips for RV tailgating like a champion. You’ll want to get your race tickets around the same time or shortly after you purchase your RV spot. Your tickets do more than grant you admission to the final event. In most cases, NASCAR race tickets also grant you access to the racetrack grounds for the entire weekend. If you’re interested in saving a few bucks, I’ve known people who are friends of vendors or pop-up shop owners to score cheap or free NASCAR tickets by volunteering to work the event. You may give up some of your freedom for portions of the weekend, but it’ll cover the cost of fuel to the racetrack and the trip home! NASCAR races are a great time, and most events include multiple races from smaller series — which you can attend on the same ticket. I highly recommend sitting in the stands for the smaller series. They’re a little like watching a college ballgame — the up-and-comers really show heart and the races can be some of the more cagey ones because they often come right down to the wire. Some useful tips for attending your first NASCAR race. Don’t come all the way and then go home empty-handed. Track-specific vendors offer plenty of goodies and memorabilia. A hat or T-shirt is a great way to remember the fun you had on your RV trip to the race. Your collection has to start somewhere! Not interested in throwing down? Pictures make great memories too — so bring your camera and have a friendly race-goer capture a moment of you and your friends at the track. Want to find fun things for your NASCAR RV camping trip ahead of time? Browse the list of NASCAR gear under $25. This is the boring — but crucial — final step. Someone else will eventually camp in your spot when you’re done with it. Always make time to thoroughly check the grounds and clean up after yourself. The track will require you to be out by a certain time — so plan ahead to complete the trash sweep before it’s too late. And finally, pack everything back into the RV, re-check the running gear, and have a safe trip home. NASCAR… RV style… is an experience you won’t soon forget!